A comedy-drama biopic based on the making of Tommy Wiseau's 2003 beloved cult film 'THE ROOM', which is considered (by many) to be one of the worst movies ever made. The film was directed and co-produced by James Franco, who also stars as Wiseau. It was written by Scott Neustadter and Michael H. Weber (the duo previously co-scripted such critically acclaimed hits as '500 DAYS OF SUMMER', 'THE SPECTACULAR NOW', 'THE FAULT IN OUR STARS', 'PAPER TOWNS' & 'OUR SOULS AT NIGHT'). The script is based on Greg Sestero (who costarred in 'THE ROOM') and Tom Bissell's non-fiction book, of the same name. The movie also costars Dave Franco (James's brother), Seth Rogen (who also co-produced the film), Alison Brie (Dave Franco's wife), Ari Graynor, Josh Hutcherson and Jacki Weaver. There's also a shitload of other celebrity cameos in the movie as well (including ones by Kevin Smith and Judd Apatow, two of my favorite filmmakers). It's received nearly unanimous rave reviews from critics (especially for Franco's performance), and a shitload of awards attention as well. I found it to be a very powerful, and well made movie! It's also pretty disturbing though. The story begins in San Francisco, in 1998, where young aspiring actor Greg Sestero (Dave Franco) meets another aspiring actor named Tommy Wiseau (James Franco). Tommy is much older than the 19-year-old Greg, and he's also very odd, eccentric and possibly mentally unstable. Greg is impressed by his passion for acting though, and the two become close friends. They then move to Los Angeles together to pursue their dreams. After failing to get cast in any major roles, the two decide to make their own movie together, 'THE ROOM', so they can cast themselves in big roles. The film then follows the whole long, bizarre process of the making of that cult classic movie. 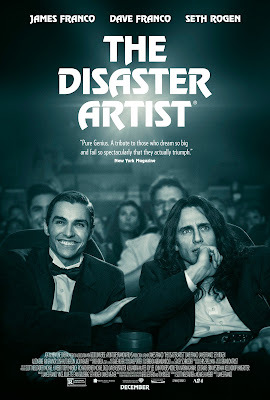 The film is a beautiful character study, of a very unique but passionate character, Tommy Wiseau, and his loving friend, Greg Sestero. The Franco brothers are both good in their roles, and Rogen is once again a fantastic scene stealer. Franco also does a really good job directing. I love the movie, because it's about having an uncontrollable passion for an art form (film in this case, and mine), and it's also about accepting people that are different, and dealing with their mental illness. The film is really disturbing, and intense to watch at times, because Wiseau's mental illness does sometimes turn abusive, and creepy. It's still always incredibly fascinating to watch though, and funny. I worry a little that the filmmaker's are exploiting Wiseau, and others involved in the making of 'THE ROOM', but I think it's mostly a loving tribute. I really enjoyed it, and I do think it's one of the year's best movies.